30 bridal gold necklace designs to check out before buying your wedding jewellery! If you are on the lookout for wedding jewellery for brides, especially a bridal necklace, then scroll down to see some of the latest necklace designs spotted on real brides and celebs. We all know how much value gold jewellery holds in Indian weddings. 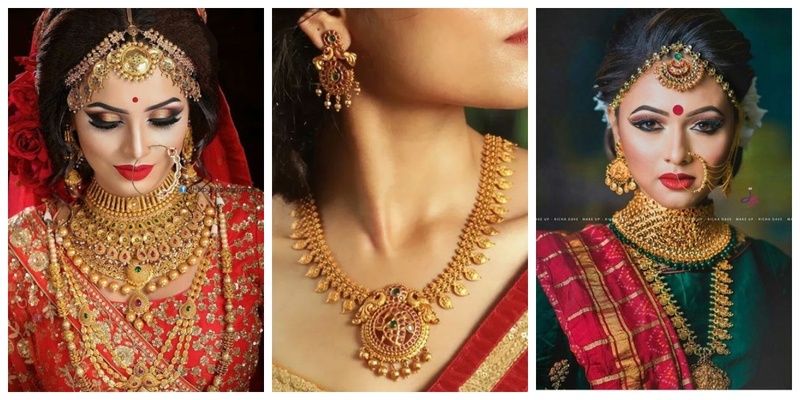 And since a necklace is the most important piece of bridal jewellery, I have compiled a list of 30 gold necklace designs for you to take inspiration before making or buying your wedding jewellery! If you are not the one to wear shiny yellow gold jewellery, then this matte gold necklace is just the right choice for you! Simple and lightweight, this gold pendant necklace looks like a complete stunner, especially if you are planning to wear a heavy bridal lehenga or silk saree for your wedding! A lot of brides these days are opting for lightweight and minimal gold pieces as their wedding jewellery. It also makes sense, as you can easily wear these necklaces or earrings to other occasions after your wedding. These necklace designs are just like that. They are simple, minimal and perfect to wear with all kinds of outfits from silk sarees to anarkali suits. Intricate, yet stunning, these gold necklaces are ideal for the bride who likes to keep it simple and stick to traditional styles. 5. Layering multiple gold necklaces like a total boss! For the bride who wants to go all out with her wedding jewellery, this is just the perfect inspiration for you! Totally love how this gorgeous bride has layered different gold necklaces with each other without overdoing it. Also, isn’t it amazing how she has worn matte gold necklaces and shiny yellow ones together?! Just look at this stunning bong bride who is slaying her traditional Bengali look with two gold necklaces of different lengths and gold jhumki earrings! This gold necklace takes wedding jewellery for brides to a whole new level. This choker necklace worn with a pair of matching earrings are perfect to form a bridal jewellery set and complete your bridal ensemble. You can check out similar gold jewellery online at Azva for more inspo! How radiant does the bride look in this minimal ivory and gold saree paired with two gold necklaces of the same length! And the gold jhumkis, uff! This Rajput-style gold necklace looks every bit of royal. If you want to stick to just one bridal necklace, but want it to be the attention-grabber, this design is the way to go! 10. Heavy pendant necklace designs that look totally gorgeous! If you want to wear a pendant necklace, but want something heavy and intricate, these necklace designs are absolute perfection. They will look even better if you match these pendant necklaces with similar earrings, mathapatti, nath and haath phool to make it into a complete bridal jewellery set. 11. A contemporary matte gold bridal jewellery set that’s one of a kind! If quirky and modern necklace designs is your choice for wedding jewellery, then this gorgeous piece worn by Atthiya Shetty is something you can draw major inspiration from! 12. An all-gold bridal jewellery set that’s making the bride’s skin glow! While this bridal necklace gives a heavy look, it is pretty comfortable and lightweight to wear. And the leaf motif it has looks absolutely stunning! Try to pair such a gold necklace with chandbali earrings and a large statement ring to complete you bridal look! 13. Traditional South Indian gold jewellery that’s not temple jewellery! An intricately designed gold choker necklace paired with a long temple necklace is perfect to wear with all kinds of bridal sarees or designer lehengas! And this bride, by pairing her wedding necklace with statement gold earrings, mathapatti and gold bridal nath has just taken her look to a whole other level. If you wish to wear the complete bridal jewellery set, but don’t want to go overboard, then a matching gold jewellery set like this one is perfect to wear on your wedding day. 16. A contemporary necklace design at its best! This gold necklace right here is for the fun and experimenting bride who wants to try something hatke for her wedding. The modern design of this necklace with geometric motifs is nothing less than a work of art! A truly statement-making piece, this gold necklace draws inspiration from the Rajputana-style and makes it even more grander than its original self. Just wear this beautiful necklace with a deep cut choli and embroidered lehenga to look like a surreal queen! If you want to jazz it up a bit, then a passa or maang tikka will do the work. Skip the earring with this one! If you are all up for wearing heavy gold necklaces that shine brighter than the sun, then this necklace design is all the wedding jewellery inspiration you need! Totally digging at this bride’s all-gold look! 19. Ace the minimal jewellery look! If minimalism is your second name, then this Bong bride here can be the inspiration of your wedding jewellery. The layered gold necklace along with a heavy and long gold chain completes her look. Her minimal maang tikka and jhumki earrings are super-cute too! 20. Slaying the Maharashtrian look with traditional gold necklace designs! If you are planning to wear a Paithani for your wedding, this kind of bridal jewellery will look stunning with it. These two brides here have worn their necklaces in layers of various lengths. These traditional necklaces include vajratik, mohanmaal, Kolhapuri saaz and thushi that help complete the entire necklace set. A smaller temple-style necklace paired with multi-layered long necklace and matching earrings is all you need in your bridal jewellery set. Oh, and this kind of wedding jewellery looks great with bright kanjivaram silk sarees! This necklace design is for those who prefer not to wear gold in its bright yellow and shiny form. This bridal necklace has a gorgeous antique finish and is studded with small gemstones to give it a royal look! Keeping the look simple yet traditional, this bride has chosen to wear a beautifully intricate choker necklace with a long multi-layer beaded necklace as her wedding jewellery. The matching earrings and maang tikka are just like a cherry on the cake! Keeping the beads theme common in her wedding jewellery, this bride looks radiant in a small pendant necklace, which she has chosen to pair with a longer multi-layer beaded necklace. The temple mathapatti, gold nose pin and large umbrella jhumkis just bring together her entire bridal look! The beauty of this necklace lies in its minimal design. It takes the done-to-death floral theme in jewellery to whole other level by giving it a contemporary touch. 26. The beauty of this matte gold bridal necklace is just WOW! Simple and traditional, this gold necklace is just the perfect bridal necklace if you are looking to wear a traditional design on your wedding day, but don’t want it to be bright and shiny. The matte finish and muted yellow tone of this bridal necklace is a complete winner! Okay, maybe not as huge and grand as the bridal jewellery worn by Jodha, but this gold necklace sure gives the same vibes! Totally loving how the bride has gone all out and teamed her wedding necklace with earrings, maang tikka, paasa, haath phool and a nath! 28. Queen Deepika slaying a gold necklace like none other! An intricate gold necklace and a mini chandbali complete Deepika’s traditional look of a beautiful red Kanjivaram saree! This tribal-style bridal gold necklace is for all those edgy and fiesty brides who want anything but ordinary on their wedding day. The earthy tones of these necklaces make them a great option to pair with bright and popping silk sarees. Giving the traditional coin necklace a spin, this beautiful bridal choker necklace by Azva has overlapping coins with intricate engravings and dainty kundan flowers that contrast beautifully with the antique gold finish! Did these bridal necklace designs give you some ideas for your wedding jewellery?